A recall of more than 130,000 pounds of Tyson chicken nuggets begs a question: Why wasn’t this problem caught before it was sold to consumers? The story so far: Tyson Foods sells a variety of frozen chicken products, many of which come in America’s beloved nugget form. On July 18, Tyson produced both five- and 20-pound bags of its “Panko Chicken Nuggets,” the larger size destined for institutional use in Pennsylvania (read: prisons). The five-pound bags, though, were sold by Costco, and ended up in the hands of those not convicted of crimes in the Keystone State. Unfortunately, Tyson immediately began receiving reports of foreign objects inside the nuggets. This material appeared to be some sort of plastic shrapnel, some of it quite large—almost an inch long. The USDA’s Food Safety and Inspection Service (FSIS), the agency in charge of recalls, announced on September 27 that Tyson had initiated a large voluntary recall: 132,520 pounds of the nuggets. The recall, though not as large as the Pilgrim’s Pride nugget recall from earlier this year, maintains the highest danger level of recalls, Class I. From the FDA: “Class I Recall is a situation in which there is a reasonable probability that the use of, or exposure to, a violative product will cause serious adverse health consequences or death.” Hoo boy. Tyson says that it believes the plastic shrapnel may have come from a piece of the processing equipment, a large plastic rod that connected a transfer belt. But here’s where it gets crazy: Tyson’s quality control system actually worked perfectly. The plastic shrapnel made it through because Tyson’s scanners only detect metal. This seems…questionable! 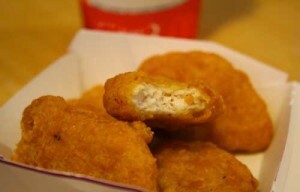 Surely there must be some way to figure out whether large chunks of plastic have made it into chicken nuggets, no? For more information on the recall, including the specific batch numbers that will alert you to whether you have a tainted batch, head over to the USDA’s site.